If you have recently purchased a new home or if you’ve not renovated your own dwelling for a little while, the lure of open plan living can be overwhelming. When you glance at your humble abode, you see numerous rooms downstairs, blocked off by walls, compartmentalized and blocking out the natural light that you crave. Switch on the TV, and home makeover shows reel off renovation after renovation singing the praises of open plan living, the natural light it allows, the space it creates and the lifestyle it affords. Open plan living looks amazing on the TV, but what about real life? Is it all it’s cracked up to be? Take a look at the pros and cons of open plan living and decide if you want to head down the open plan road when you come to renovate your home. The natural light that you will see streaming into your new open plan living space can make any renovation seem worthwhile. With windows creating multiple aspects, you’ll also be allowing the outside in. Vistas become more accessible from any position downstairs through multiple viewpoints. The atmosphere within your house will naturally shift from fragmented to all inclusive. Your kids won’t have a choice but to be in the same vicinity as you as they watch TV and you cook up your latest culinary delight. The impetus to enjoy more quality time together as a family can make open plan living a worthwhile venture. Although the square footage of your floor plan won’t have altered, it will feel like you have created more space. This illusion can make the resale value of your home increase as open plan living is the most favorable lifestyle choice today. Homeowners enjoy inviting friends around for a dinner party or a gathering and love having a large flowing space that is flexible to entertain in. The actual renovation itself will be a liberating experience. There is no better way to release your frustrations and anger than by grabbing a sledgehammer and knocking down a wall or two. If money is tight, look into using a homeowner loans company to fund your renovation plans. You can utilize their online affordability calculators and borrow well within your means. Although the cost of converting to open plan living may seem hefty, you could see a healthy increase in the value of your home when you come to sell it. It’s always best to think of your renovation as an investment. The sheer scale of creating a single open plan living space from three or four distinct rooms can seem overwhelming. The labor costs can be steep, the dust and mess created will last for a few weeks and the project can seem like an uphill task. Open plan living is a dramatic shift in lifestyle, so if you aren’t sure, it pays to hold off before embarking on any renovations. It’s easy to knock walls down but a lot harder and more expensive to put them back up. Open plan living will inevitably see a merging of your kitchen, dining room and living area. This means all those cooking smells from your fragrant Thai curry will linger when you settle on the couch to watch a movie three hours later. This can be a pet peeve of many so think about the practicalities of open plan living before you allow yourself to be seduced by the stylish facade of a home makeover show. While open plan living and quality family time sound great in theory, there will be a lot less space downstairs to find a moment of privacy, and you may find your kids spending more time upstairs holed up in their bedrooms. You may want to consider whether you actually need to renovate or whether you are happy with the configuration of your home the way it is. Just because something is on trend doesn’t mean you have to succumb to it if you are more inclined to enjoy the traditional home layout. Home renovations are expensive and dramatic. By their very nature renovations allow you to refresh your living environment and can afford you a new lifestyle. However, open plan living is not the only renovation available to you. If you wish to create a new look for your home, a simple and cheaper redecoration, new kitchen or even an extension may be the answer. Only once you’ve assessed the pros and cons of open plan living, can you decide if it is right for you. Almost any adult will understand the complexities and stresses involved in moving home. When you have a family, these problems multiply tenfold. Not only are you responsible for your own happiness and well-being, but you also take on the role of ensuring that your children are well in regards to every aspect of the move. Are there good schools in the area? Will there be a nearby park for them to play in? Are the crime levels low? Is the neighborhood friendly? The list goes on and on. But not to worry, we’re here to help! Read on for a complete guide to finding the perfect family home. Choosing the location of your new home is the first step on your journey to paradise. So start doing your research and visiting the areas that you’re considering. Before laying down any deposits, take a visit to your potential new home. Take two weeks out to get a real feel of the area. You can also use this vacation to view homes and have meetings with the local schools and other facilities. Remember that the place that you move to will have so much more to offer than just its tourist hotspots. It will most likely be host to multiple counties and home to thousands of people besides the tourists that frequent the area. So choose your area well. It is so important to find something that will suit every single family member down to a tee. So check out local amenities, clubs and activities. There are three types of housing available within most communities: townhouses, single family homes, and condos. If you’re reading this article, you’re probably best suited to the second of the three. A single family home allows you complete control of your entire property, meaning you can make major renovations if you so wish. You will have a private yard which is essential for the summer and there are favorable mortgage rates. If you’re struggling to make a decision in regards to the type of home you’re interested in, check out this homebuyer’s checklist for properties. It has all of the information you could possibly need and more. If possible, try to choose somewhere that already has family and friends living nearby. This will make the move smoother and less frightening for your little ones. Seeing familiar faces can put their minds at ease and relieve anxieties. If you don’t have family or friends in the area you’re planning on moving to, make sure that you help your little ones socialise as soon as you move. Take them to activities and clubs, introduce them to new hobbies such as team sports. This will help them to make friends and feel comfortable in their new community. No more feelings of loneliness! Also make sure that they know they can contact their old friends at any time. Apps such as Skype and Facetime mean that they can literally see their friends, not just hear their voice on the other end of the phone. First impressions are everything, and you know what they say; you don’t get a second chance to make a first impression. This is why curb appeal is so important. No matter whether you are trying to sell your home or you simply feel like giving it a bit of revitalization, we have some top tips for those who want to give the exterior of their property a boost. Read on to discover more. Invest in quality door furniture – First and foremost, while we all want to do things without spending a lot of money, it does pay to spend a little bit more in some instances. Door furniture is a prime example of this. From letterboxes to door knockers, choose something that is in keeping with the style of your property, and allocate a little bit more of your budget to this if possible. After all, cheap can look cheap. Build a walkway – Another way to give your home some more curb appeal is to build a walkway. This will make your property feel more inviting and warm. If you have a straight concrete path, and you want a subtle upgrade, you could apply a colored concrete resurfacer to the old walkway, and then edge it with stone or brick borders. If you are after something more dramatic, why not replace the concrete with a walkway that is made from brick or stone. Dress up your driveway – Does your driveway have vegetation sprouting from it? Perhaps it is stained or cracked? If so, you can upgrade your driveway without having to spend a fortune on completely redoing it. Firstly, you should kill the weeds, and repair the stains and cracks. Once you have done this, you can affix flagstones or stain the concrete to dress it up. Tile your doorstep –Tile your doorstep to create a permanent welcome mat. There is no end to the creativity you can display when going for this option. The sky is your limit. Replace gutters – If you have an old gutter system on your property, it is likely that it is suffering from rust spots, peeling paint, and a number of other problems. It is a good idea to replace your gutter system so that you don’t give off a sense of neglect. Here are some signs you should replace your gutters: http://www.weatherguardgutters.com/5-signs-to-replace-gutters/. Copper systems are quite expensive, but they have an unmistakable look of quality. Create a new planting bed – Add color and contrast to the exterior of your home with a new planting bed. The best spots for curb appeal include immediately in front of your property, along walkways or driveways, and at the front corners of your yard. When you choose a flower bed, you shouldn’t choose features that are going to obscure your home. Instead, look for those that will frame your home. To edge the bed, precast-concrete blocks are ideal. You should also include a mix of texture, color and plant size for the best results. Add some outdoor art – You can add some sparkle and personality to your outdoor space by investing in outdoor art. This could be anything from wind chimes and sculptures to metal cut-outs and birdbaths. Choose something that complements your home’s exterior elements and natural palette. Water sculptures are an amazing choice because they look incredible and they add a soothing and peaceful element to the home too. Install window boxes – An easy way to add charm and color to your home’s curb appeal is to add window boxes. For a cottage feel, opt for painted wood window boxes. If you want a more traditional look, choose iron or copper. Give your mailbox a makeover – Your mailbox should complement your home, and it should express your personality too. There are so many cool and fun mailboxes available, or you could go for something with more of an antique and old school vibe. The options are endless, but you should ensure your mailbox is a statement piece that demands attention. Create an instant garden – You can create an instant garden by adding containers with plants around the front of your home. This is a great way to add color and personality to your home, plus you won’t need to spend a lot of money either. Paint the exterior of your home – This is one of the easiest ways to add value to your property, and it makes a massive difference too. You can find out more about exterior residential painting services at www.ecopainting.ca/residential-painting/. When it comes to painting the exterior of your home, you need to choose a quality company to ensure that the harsh weather does not have an impact. Install outdoor lighting – One of the best ways to boost your home’s curb appeal is by adding landscape lighting. This is the perfect way to create a welcoming atmosphere. Create perfect symmetry – Symmetry is really easy to arrange, and it looks incredible on the eye too. A symmetrical composition of front-door accents and light fixtures generates an entry that is welcoming and has lots of curb appeal. Dress up the front door – When it comes to curb appeal, the focal point is always the entry to your home. You can make a real statement by giving your front door a makeover. Why not opt for a custom wood door? Or, add some vibrancy with a striking colored door? The options are endless. You should also use metal polish on door fixtures and clean off any dirty marks around the doorknob. Remember, your personal style is always the most important, so make sure it is reflected here. Your home’s entry should be an indication of the interior inside. All in all, there is no denying the importance of ensuring your property has plenty of curb appeal. This is the first thing people will notice about your house, and you want to make a good impression, especially if you are planning on selling it. Use the tips mentioned above, and you will give your house a makeover that will turn heads for all of the right reasons. We have all dreamed of living in a huge house – a mansion – because we have always dreamed of more space. The idea of having eleven bedrooms and twelve bathrooms and three kitchens, all with Aga’s, and a garden that would rival Central Park in New York. However, for all the dreams that swirl around the world, the reality is often very different, and that is the case with mansion life. It just isn’t the simple life of luxury we all imagine it to be. Yes, we want to enjoy more space, but not to the point that our home feels empty and bare no matter how much furniture we throw at it. Even if you just living in part of a mansion, one wing or one floor on one wing, trying to make two sofas fill a ballroom is like trying to make two drops of water fill an ocean. High ceilings and vast spaces don’t add to the cozy feeling in any way whatsoever and this only gets worse when winter starts to creep in. Even in the height of summer, a mansion can feel abysmally cold as you spend a large fortune on logs for your fireplace and oil for your ancient heating system. Having the internet reach every corner of every room in your home is a luxury. Anyone that lives in a big house will know that this is hard to disagree with because in order to enjoy that same nuisance-free existence they have had to invest in multiple wifi extenders if they want any chance of getting any web browsing done. As for 4G, well, either it hasn’t reached that part of the countryside yet or it can’t penetrate the thick walls. If you live in a mansion with a mansion-sized garden then trying to keep on top of the lawn alone is like having a full-time job, except you don’t get paid to do it (and you don’t get paid to do your normal job because you are spending your entire life mowing). Not to mention that, once you’re done, you’re more out of breath than an amateur marathon runner that decided they could participate without any training. The only thing that leaks more than your roof is your money, with every cent you have seemingly being pumped into your home. Trying to repair broken beams, or replace another shattered pane of glass, or the leak in the roof, or discover where that god awful smell is coming from, or trying to keep the place warm, or whatever. It is a constant drain on finances, and we mean constant. Big, old houses make loads of noises, and most of them are really eerie noises. Something will fall down between the walls or the sound of a ghost will interrupt your dinner. But that isn’t all because there is also the constant worry that someone will break in through any number of easy to lift windows or shrunken doors that don’t seem to lock properly anymore. Just walking around a big house can be terrifying and you’ll start to curse your own imagination as time goes on. Does Heating Your Home Have To Cost You A Fortune? No-one likes feeling cold and walking around the house with a blanket wrapped around your shoulders is not a good look. On the other hand, you don’t want to spend a fortune heating your home if there are ways in which you can save money. Heating costs make up a huge proportion of the average monthly budget so if you can make some savings you will have more to spend on the things that you enjoy. Here are some ideas for cutting down your heating costs over the cooler months. You need to have accurate control of your heating. Programmable thermostats allow you to heat your home when you need to and save money on heating bills when you do not. You can make sure that the house does not use up money on heating during the day but is lovely and warm for when you return from work. There are some jobs that need to be done on your home every ten years or so and if you are considering carrying out an overhaul of your central heating system, this could be the time to upgrade your thermostat. Check out the honest and concise reviews of wireless and programmable thermostats on the Thermostat Center including a handy comparison table of the key features. The best place to start is with the buying guide and then move on to reading about how they can save you money before selecting which would be the best one for your home. Heating you home is as much about stopping heat from escaping as it is about providing heat in the first place. Insulating your loft is the single most important heat saving strategy. Warm air rises and your home will lose a lot of heat through the loft. Next, comes the windows. Double-glazed windows are the best. If you cannot afford to install them you can hang thick drapes or blinds instead. Use draught excluders at the bottom of doors. Sometimes it is possible to provide cavity wall insulation in older houses but you will need to talk to a professional contractor to find out more. In general, new houses and more heat efficient than older houses. You can use natural convection currents to make the most of the heat in your home. Don’t place things on top of radiators so that the warm air can circulate freely. As sunlight pours in through your windows it brings the heat with it. Vary the room that you spend time in as the sun moves around the house so that you can take full advantage of this. Consider installing a wood burning stove. 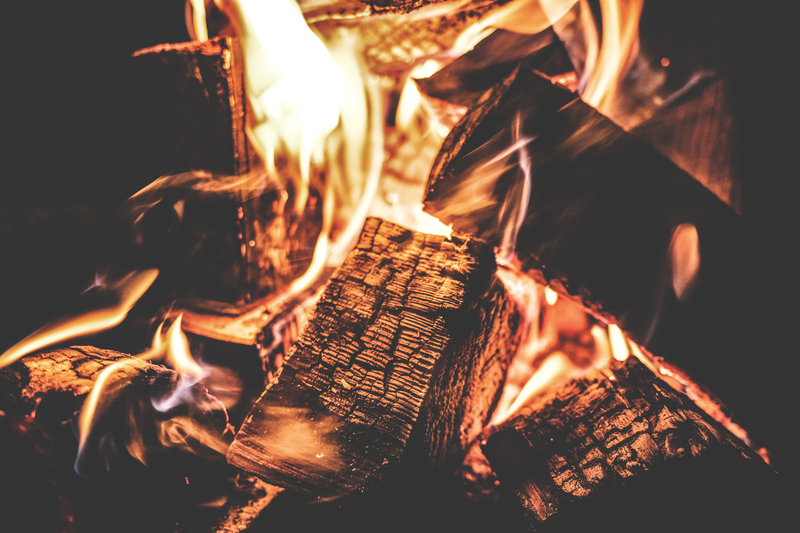 When wood burns it gives off a huge amount of heat that can warm up even a large room. You could collect driftwood or branches from a local wood to burn. You can even chop up old pallets as long as they are not covered in paint or varnish. Real fires are so cozy in the winter! We all know how much work it is to keep our homes looking their best. With the long list of daily and weekly chores, it’s no wonder the bigger jobs tend to go neglected for longer than they should. However, there is a list of areas in the home that need attention every ten years in order for your home to be properly maintained. These 10-year jobs are just an important as the everyday jobs to ensure that your home not only looks great but to ensure that it doesn’t need major renovations later on down the road. Blow the cobwebs off your paintbrushes as it’s time to get to work on giving your home the quickest, easiest and most effective facelift possible in your home. A fresh coat of paint is the easiest way to modernize tired and tatty looking rooms and bring your home back to its former glory. Paint gets really dirty over the years and the only way to remedy this is to give it a fresh lick of paint. Re-painting the rooms in your house is not expensive and you can do it yourself, meaning you don’t need to pay for hired help. You can think about new color schemes in your home to make it look unique, fresh and a more enjoyable space to be in. Roofing experts recommend that homeowners replace the roof on their homes every ten years. Roofs can take a real battering from the outdoor elements so it is really important to keep them in peak condition so as to avoid much bigger and more expensive problems. If it’s been awhile since you last looked at your roof, get a roofing expert over to your house to take a look at the state of your roof. Learn about Dennis and Sons Roofing or a local company in your area that will be able to come and look at any sagging roofs or leaks and will then be able to advise you on the next steps necessary to protect your roof and therefore your entire home. There are many tell-tale signs that you can look for to see if you are ready for a replacement, such as water trails under the roof area and light entering through cracks in the roof. So keep your eyes peeled for any warning signs that your roof needs immediate attention. Replacing your roof every ten years means you can avoid having to do emergency jobs, as and when necessary, and instead, can enjoy the comfort that comes with knowing your roof is always in peak condition. Plumbing bills can really creep up on us when we least expect them and they can really sting. Therefore it is recommendable to replace the plumbing in your home around every ten years. You can either replace the entire plumbing system or you can just replace the exposed pipes. Calling in a plumber and asking what is the best option for your home and then getting an estimate is the way to go, as unfortunately, this is not a job you can take on yourself. Create Your Own ‘Barbie Dreamhouse’ & Make Your Childhood Dreams Come True! As a child did you ever dream of living in your very own Barbie Dreamhouse? Did you love the way in which Barbie’s home perfectly reflected her tastes – lots of pinks, and her style, as well as her needs? Back then, you most probably wanted a pretty pink home like Barbie’s. Today, you may no longer want to build a life-size version of Barbie’s Dreamhouse, but what you might want to do is build your very own dream house – somewhere that reflects your personality, style, and needs. Thinking about moving anyway and love the concept of living in a home that’s custom made for you? Then read on, for everything that you need to know to make those childhood dreams come true by creating your own dream home. Like with any project, the first step is to set a budget. As once you have set a budget, you then know what you have got to work with, and can use your budget to determine what is and isn’t within your reach when it comes to the design of the property. As well as working out what your budget will be, it’s also important to think about where the funds will come from and when you will have access to them. Do you have savings that you plan on using to fund this project and can access immediately? Are you planning on selling your current property and will need to wait until then to get your hands on the funds? Or, are you hoping to take out a loan and have the money shortly? For any project, setting a budget is the most important thing, so this has to be your first step. Once your budget is in place, the next step to take is to get inspired. You may already have plenty of ideas about how you want your dream home to be, but even so, it still pays to take the time to get some ideas and inspiration. You never know, you might come across some design ideas that you wouldn’t have even considered but love. As well as looking at ideas in home design magazines, online on sites like Pinterest, We Heart It, and Instagram, it could also be worth taking the time to look at a range of house plans. From modern house plans to more traditional ones, it’s worth having a browse, to get an idea of what your options are. To ensure that your dream home is perfect in every way, getting ideas and inspiration is a must. Before you can start your project, you need to select a plot. Now, whatever you do, don’t make the mistake of rushing the process of picking a plot, else you may live to regret it. Take the time to research locations that have plots for building properties on and learn as much about each area as you possibly can. Even if the location is near to your current home, it’s still worth taking the time to research the area, to ensure that it’s somewhere you would be happy to live. There is a lot of emphasis on eco-friendly living today, which is something that can be hard to implement in an older building or implement fully. However, if you are building a new home from scratch, you could consider making it an eco-friendly and sustainable property. It might cost a little more to build, but in the long-run, it will save you money in terms of running costs, plus it will reach a higher value should you ever choose to sell up. From choosing to use eco-friendly building materials like reclaimed wood, to implementing green features like solar panels, wind turbines, and water power, there are plenty of ways you can make your new build green, helping to reduce your carbon footprint. To determine the best way to create a greener home, talk to your contractor about it. Don’t make the mistake of focusing purely on the exterior and layout of your dream home, as it’s just as important to think about the interiors. The layout of the property will impact the interior design and layout of it, so it is worth thinking about the interiors and the types of spaces you want inside your property. It’s not necessarily about things like room color schemes or furniture styles, it’s about how light and airy the rooms are, and the vibe that each room creates. To design the most incredible house that makes your childhood home design dreams come true, building from scratch is the answer. Sleeping in hot weather is about as horrendous as a first world problem can get. All that tossing and turning, your sheets sticking to you as you roll over for the four-thousandth time, your sweat somehow becoming the strongest super-glue known to humankind. It’s one of the worst, and that is without even mentioning the side-effects of not getting any sleep which, let’s be honest, isn’t great. After all, sleep is one of those healthy habits we all need to get into the habit of doing. That is why we have done our research, dug around, asked our most innovative friends for their advice, and come up with a list of little tips and tricks that can help you endure the warm summer nights and wake up feeling super-duper refreshed. So, without further ado, we bring to you a list of the best tried and tested means of keeping cool when your eyes are closed. One of the best ways to keep yourself cool just long enough to fall asleep is to splash your sheets with ice cool water before you slip under the covers. We don’t mean fill up a bucket and toss it over your bed, we just mean sprinkle a bit on your sheets; a light misting if you will. This will help you cool down and prevent you sweating, which is exactly what you need in order to slip off into the land of nod. Aircon is fantastic for keeping you cool, but most people only used in the day because the costs can quickly add up when it is left on all night. Well, there are some tricks you can use to reduce the costs and allow you to catch some Zs. Home Comfort owner Ken Starr explains how a single maintenance check can restore your A/C device back to its factory settings, making it more efficient and cost-effective. The other thing you could do is plug it into a timer socket, which would prevent it from all night and switch off about half an hour after you start dreaming. That’s what we’re here for. If you are like the rest of society then you probably have a multitude of electronic devices on charge by your bedside table. Your phone, your tablet, your laptop, your Tamagotchi and whatever else. You may even have a bedroom TV and an alarm clock. However, by turning off all your plugs at the socket, not only will you be saving yourself some money and energy, you will also make your room cooler. The reason being, your plugs give off a significant amount of heat. It can be so tempting to get into your birthday suit when it gets really hot, but whipping off all your clothes is not the answer when it comes to getting a great night sleep. What you want to do instead is sleep in cotton pajamas, something light and airy. The reason being these will allow your skin to breath while any sweat is soaked up rather than clinging to your body. That means your sheets won’t come untucked every time you roll over. What you drink in the hours before bed can make a huge difference to how well you are able to sleep, and that is without accounting for the hot, hot, hot weather. Booze will affect your ability to sleep even more when the night is warm. As such, drink something that is known to encourage a good night’s sleep, and take a glass of ice-cold water to bed with you. That way you’ll easily be able to regulate your temperature should you get too hot. When the winter settles in, we all love snuggling up with a hot water bottle and keeping warm that way. That’s why it is so worth going the way and making a nice ice pack that you can then snuggle up with when it is hot. All you need to do is fill a sock with rice, tie a knot in the end and put it in the freezer for about 20 minutes. Then take it to bed with you and place it gently on your pulse points – wrists, ankles, feet, temples – and feel your body temperature instantly drop. Hello, good night’s sleep. The big problem with having a fan in your room is that it just blows warm air about and no one wants to be in a bedroom where a hot desert wind is blowing about. That’s why it is worth making a few amendments to your fan’s abilities. First off, try filling a bowl with a large chunk of ice (or just loads of little chunks of ice) and placing that in front of the blades. As the ice melts, your warm wind will turn to a gorgeous cool wind. The other thing you could do is face your fan toward the open window. This will then pull the warmness away from your room and toss it outside, where it belongs. The number one reason why people get stressed out when moving home is that they simply aren’t organized enough. As a minimum, you need to set your move date, get your affairs in order, pack your whole house up and stick to your moving schedule. This is a lot more taxing than it sounds, so make spreadsheets, use charts and get the whole family involved if you want to make it easier on yourself. Having a to-do list where you’ve listed every task in order of priority and urgency might seem like a small thing, but it can help you to keep things on track and feel more under control, which will help you to avoid those last minute stresses and panics that come on when you realize you haven’t booked a kennel for the dog on moving day. Hiring a professional moving company with years of experience and numerous options including long distance moves and international moves, of which you can get more details from Corrigan Moving Systems, will not only put your mind at rest that your stuff will get to its destination in a timely manner, but it will also cut the chances that your precious things will turn up broken significantly. Another major moving day stressor is that realization that you’ve booked the moving van for the week before you’re set to move in. You might think this rarely happens, but it’s actually very common, and it can be disastrous when you’re left stranded with your belongings in a new place with nowhere to go. That’s why you should always double check every little detail. If you want to avoid the stress that comes with unpacking when you get to the other end, pack one room at a time and pack in order of least to most likely to need when you get there. That way, you’ll be able to access the essentials like dishes, plates, and bedding immediately without having to upturn all of your packing boxes and make a huge mess in your lovely new home. Of course, the best thing to help you avoid the stress of moving home is to ensure that you and your family take some time out from planning and packing relax and have some fun together. Go to the park, see a movie, hike the local trail one last time and you’ll feel a whole lot better. Have you moved house recently? Do you have any tips to make moving a smoother, stress-free process? There’s nothing like having a baby to make you realise that yours and your partner’s ‘young couple’ flat doesn’t have enough space for your growing family. Unfortunately, you have to balance your budget so you can afford both a bigger place, and everything else your little one might need. It’s an overwhelming, but necessary, undertaking. Here are a few tips to get you through this exciting time. When it was just you and your partner, you might have been happy living somewhere within your price range, close enough to work, and not too far from any amenities. Now that you have a baby on the way, you might want to narrow down your criteria. Do you want to live in a good school district? Would you prefer a bungalow so you don’t have to babyproof the stairs? Be clear on what you want before you officially start your search. With some much going on at home, you might not have time to search the classifieds, property websites, or peek through the real estate agents’ windows until you find something you might like. Instead, have someone else do the searching for you. Agencies in your local area, such as Manausa Realty, have expert agents that are paid to take all your requirements on board and mind a property that meets all your criteria. Alternatively, you could go to a property comparison site, fill in your budget, area, and room requirement, and sign up to get emails whenever a property that meets your criteria goes on the market. However, you might be better off with an agent; they can let you know about new properties before they go on the website, increasing your chances of getting your dream family house. Remember, you’re not just buying a house; you’re buying the whole neighborhood. Will it keep your kids awake at night if they live close to a busy road, or if the neighbors are too loud? Can you live next door to someone who doesn’t keep their front lawn up to standard? Is it better to live close to a park or a small corner shop? If you think you might like one of the houses on the list, take a walk around the block and see if you can imagine your whole family happy in the area. Before you sign any documents, you should request an independent inspection of the house. The home inspector will look for hidden problems with the house, and you can learn about any issues that may prevent you from buying the property before it’s too late. This may include mold problems, termites, foundation problems and a bad roof. The last thing you need is a faulty house when you have to look after a newborn. The inspection can save you thousands in repairs later on, and you can rest easy knowing your new house is child friendly. If there are problems, you might be able to renegotiate the price. Whether you have just bought a new property, are happily settled in your home or are looking to sell up and move, there are loads of easy ways that you can add space and value to your house. Before you bring in the buildings and plumbers and decorators, it is worth checking with your local estate agent whether or not a major home improvement will add value to your property, and if there are any features which are particularly sought after in your area. Remember that every property has a ceiling price, so make sure the cost doesn’t outweigh the profit in your equity. The most popular way to add value to a home is to convert the loft into a useable space. Going into the loft is often the easiest way to add an extra bedroom to the house, which will immediately push up the value into the next price bracket. It’s worth remembering that an extra bedroom can add anywhere between 10% and 15% to the value of the property. However, a loft conversion will usually be around $20,000 to $25,000, and you will need to get planning permission from your local authority before you get going. A fresh paint job will do wonders for the value of your property and can turn your home from old and tired into fancy and fresh. If you don’t have time to do it yourself, you can hire someone to do the residential exterior painting, as well as a painter and decorator for the inside. Stay away from bold and dark colors if you are reselling, as they will make a room or space seem much smaller than it actually is, and also hire a professional if you are in danger of making any decorating or DIY mistakes! The kitchen is the heart of the home. It’s a place where people gather on social occasions, where families eat and deep conversations are had. As this room is such an integral part of the home, it is important that it is attractive looking and functional. If you don’t have the money for a full kitchen refit, there are some simple and easy things you can do to bring it up to a higher standard. Try replacing cupboard doors and handles for a quick and easy refresh and aim to create a space which is multipurpose. Most people spend the majority of their time in their kitchens, and it must be able to function as a place for kids to do their homework, guests to relax in while you are cooking dinner and family gatherings. Updating the kitchen doesn’t have to cost the earth, but it will be worth every penny. Outdoor spaces have become a room in their own right, and investing in your garden is big business. By having a garden which is well laid out, you are not only adding value to your property but will also make it easier to sell! It’s common knowledge that the color scheme you pick for the walls can have a massive effect on how comfortable and welcoming an interior space feels. However, choosing the palette you’re going to use before anything else can be a huge mistake, and will mar the rest of your interior design work going forward. First and foremost, you should choose some essential fabrics, such as the rugs, upholstery, window treatments, and pillows. Once you’ve got this out of the way, you’ll find it so much easier to choose an appropriate color scheme from a set of paint chips or a fan deck. Working backwards; trying to find fabrics that match with a color scheme you’ve already chosen, is so much harder. Obviously, you don’t want to spend a whole weekend repairing last week’s mistakes. However, being afraid of making any kind of bold, adventurous decision with your décor can lead to your rooms feeling unsatisfying and bland. Take some risks, and try to think outside the box here and there! Whether it’s an extravagant focal point like a mounted animal skull or indoor waterfall, or an unconventional bit of lighting, don’t be afraid of experimenting with your space. Remember that if anything feels too bold or dramatic, you can always balance it out with more light and breezy features, such as neutral fabrics and furniture. One-stop shopping is very popular with amateur interior designers these days. However, furnishing a space with pieces all bought from the same store tends to create a much more boring visual story, compared to what you can achieve by shopping around a little more. Instead of confining your shopping trips to a single store, check out a few boutiques that stock a number of different design lines and brands. By doing this, even if you have a preferred period or style, you’ll make it easier for yourself to create a unique interior, rather than another cookie-cutter home. Finally, a more practical issue, that’s unfortunately very common. Showrooms are massive, and can make it hard to judge the scale of a given piece of furniture relative to the space it’s intended for. This is why so many people bring a beautiful coffee table home, only to realize that it feels like it’s eating up the entire living room. Get some measurements, and bring some cold hard numbers with you whenever you’re heading out on a shopping trip. You don’t want to spend a small fortune on a piece that makes your home feel cramped! While your home might feel like the most secure place in the world, it has many hidden dangers that could be harmful to your little ones. And while things might be going great when your baby is immobile, as soon as they get on the move, everything changes. Before you get to this stage of crawling, rolling, and walking, it’s vital to ensure your home is baby proof – for their safety and for your own peace of mind. Let’s take a look at some of your options. Babies are inquisitive little souls, and as soon as they are on the move, they will explore everything – including your kitchen drawers and cupboards. Naturally, the slightest little accident could result in a very painful experience for them, and a stressful one for you. But what can you do? Try investing in some hinge protectors for a start, which will help your baby stop trapping their fingers inside. There are also door stoppers which will prevent doors and drawers from closing to consider. You should also bear in mind that electrical points are also a danger, so buy some covers for any sockets that are unused. Baby monitors are essential for nervous parents and will help you hear your little one when they are crying out at night. You can also check a security camera review or two to find an internal camera if you want to keep your eyes on your baby, as well as your ears. But the most important thing you can do regarding childcare is to make sure you are ‘always on.’ It only takes a second for an accident to occur anywhere in the house, and you need to be aware of where your little one is at all times as they grow into a toddler. Look around your home at all your bookcases, shelving units, and wardrobes. Now imagine what will happen if your baby decides to try and pull themselves up – the result is incredibly scary even to countenance. So, make sure that all your furniture is fixed onto the walls, so that it is impossible to fall down on top of your children. It’s cheap to do – and simple with a few basic DIY skills – so get it done before your baby starts to get moving. Whatever your baby gets their hands on as they start to become more mobile can end up being dangerous. So, it’s vital that you think about rearranging your cupboards, drawers, and storage, so everything that can cause harm is well out of the way. Knives, heavy pans, crockery, tools – the list is a long one, and it all needs to be well out of harm’s way. Babies will explore their surroundings with great detail, and whatever they find ends up in their mouths – it’s how they experience the word in these early years. So, make sure you are using your vacuum often: you never know when a visitor might drop some medication or bring in something nasty on their shoe which could result in a very ill child. Are You Living In A Green Home? A lot of us don’t think twice about how eco-friendly our humble abode is. After all, when we are busy bringing up our family, the environment is the last thing on our mind. But for the sake of future generations, we do need to think twice about our home. After all, we want our kids to live in a healthy world. Therefore, here are some things you can do to your humble abode to ensure you are living in a green home. You might have been living with the same light bulbs for years. After all, we get into the habit of buying the same ones every time. But they might not be the best energy-efficient option for your home. And you might be using a ton of energy which will not only raise your bills but will also waste the world’s energy. Therefore, to ensure you are living in a green home, it’s time to change those lightbulbs to an eco-friendly option. You need to go around the property and fit eco-friendly LEDs. They might cost more to buy than traditional lights, but they can last a lot longer. And most importantly, they will save you wasting so much energy. Not only will this help the environment, but it will also help your bank balance too! A lot of people use electric or gas for their heating in the home. After all, it’s the most common ways to ensure your house is a heated paradise. But a lot of people end up wasting a ton of energy if they are using one of these options. After all, they tend to have the boiler on from day to night to keep the property warm. Therefore, to ensure you have a green home, you should consider switching to solar energy. It’s a lot more eco-friendly as it uses the sun to heat your home. In fact, you can look at this solar energy infographic to find out exactly how it works. And while it can be expensive to install, it’s hugely beneficial to the environment if you do install these on your property. After all, it will save a ton of energy every month. Moreover, it will save you a lot of money too if you go for these panels. After all, if you haven’t used all your energy, it can be sold back to the grid to earn you extra money. And ultimately when you come to sell, the house will be looked on more favorably! It’s easy to fall into the trap of just sending everything to the trash can. But if you want to live in a green home, you do need to make an effort to recycle daily. After all, it will ensure you don’t contribute to the high amount of waste in the world if you do recycle. And it can mean that resources don’t get wasted. In fact, a lot of the items will be repurposed if you do recycle. Therefore, get a good two section bin which will make it easier to recycle at home. And then you can ensure the future is bright for the next generation. And here are some other things you can do to make the world a better place!